A hard, gritty and bleak affair of human survival. His character goes by the name Attway, a level-headed man who finds himself hired into a oil company to shoot wolves that threaten the workers. But when their plane crash lands in the fierce snowy wilderness, he becomes the leader of a ragged band of workers, and must help them evade a pack of territorial wolves. This is no action movie. The film has a plodding pace and slows down for glimpses into Attway’s thoughts as he contemplates life and death, the bleakness of the affair is deliberately drawn out. But when events spiral into chaos, the direction is intense and visceral; I have never seen a plane crash so delicately set up and so mercilessly executed. The wolves themselves are mercifully shown briefly and in shadow, evading some awkward CG effects and increasing their ominous presence. 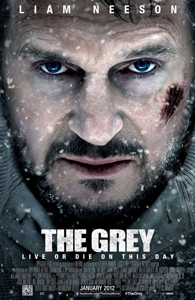 It is a relentless film, our hero is both physically and mentally battered, and Neeson’s performance is excellent; keeping us with the survivors through their impossible odds. It is not a film one can sit idly through, its intensity does not let you settle. I can only remember one light hearted moment! But, I enjoyed it for what it was, a dark, visceral and surprisingly character driven story of survival.